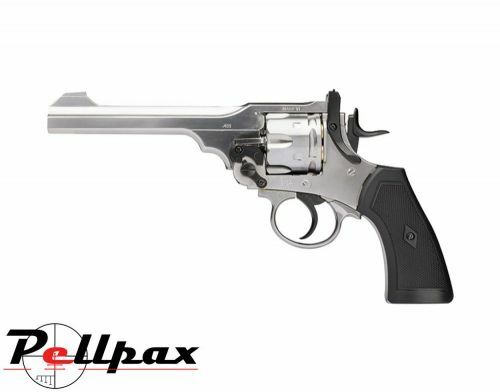 The Webley MKVI is an iconic pistol and since its release as a CO2 model has enjoyed huge success and this great pistol is now available in a striking silver finish which really catches your eye. The pistol is powered by a 12g co2 capsule which is housed within the grip and provides around 60 - 70 shots per capsule. The co2 capsule is tightened and released by the lanyard attachment on the bottom which means you can barely tell it is an air pistol from the exterior appearance. The pistols barrel breaks away from the frame, just as the original model did to allow the loading of the shells which move up as the barrel is moved further down for easy removal of shells if necessary. The trigger can either be continually pulled to fire off the 6 shots as quickly as possible, or the hammer cocked then the trigger pulled for a lighter, more precise shot control.